Kirkland Signature Cookies and Cream Protein Bars are made with 100% Protein Isolate as the primary protein source and fortified with high fiber and only 2 grams of sugar, these Cookies and Cream protein bars are your delicious and healthy snacking choice. As an excellent source of protein and fiber, these Cookies and Cream bars can be enjoyed—guilt free--any time of the day. And these Kirkland Signature Protein Bars are made with real cookie pieces. It’s a winning combination of function and flavor that is sure to satisfy. 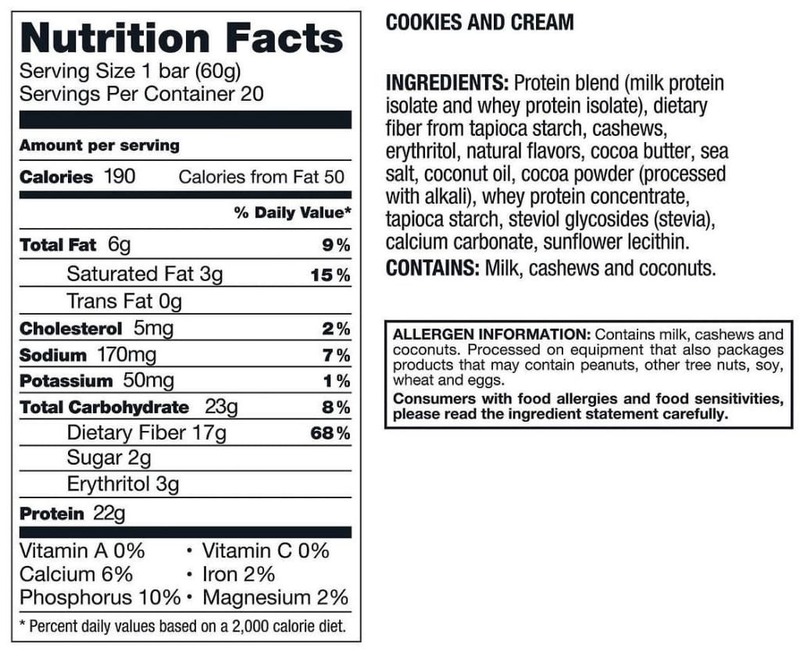 Allergen Information: Processed on equipment that also packages products that may contain peanuts, other tree nuts, soy, wheat and eggs. https://store.bariatricpal.com/products/kirkland-signature-protein-bars-cookies-and-cream 4 4.8 2356838105165 Kirkland Signature Protein Bars - Cookies and Cream //cdn.shopify.com/s/files/1/0806/1189/products/kirkland-signature-protein-bars-cookies-and-cream-single-bar-brand-diet-stage-maintenance-solid-foods-weight-loss-type-gluten-free-bariatricpal-store_572.jpg?v=1546890018 //cdn.shopify.com/s/files/1/0806/1189/products/kirkland-signature-protein-bars-cookies-and-cream-single-bar-brand-diet-stage-maintenance-solid-foods-weight-loss-type-gluten-free-bariatricpal-store_572_large.jpg?v=1546890018 1.99 USD InStock Protein Bars All All Products for Shopping - do not change Bariatric Diet Protein Bars for Weight Loss Bariatric High Protein Foods Bariatric High Protein Foods Bariatric Protein Best Sellers Kirkland Kosher Bariatric Foods & Supplements New Products Popular Bariatric Foodie Products Kirkland Signature Cookies and Cream Protein Bars are made with 100% Protein Isolate as the primary protein source and fortified with high fiber and only 2 grams of sugar, these Cookies and Cream protein bars are your delicious and healthy snacking choice. As an excellent source of protein and fiber, these Cookies and Cream bars can be enjoyed—guilt free--any time of the day. And these Kirkland Signature Protein Bars are made with real cookie pieces. It’s a winning combination of function and flavor that is sure to satisfy.